A stern-looking ‘Theresa Hay’ greeted visitors at the Durrow Scarecrow Festival in Co Laois. 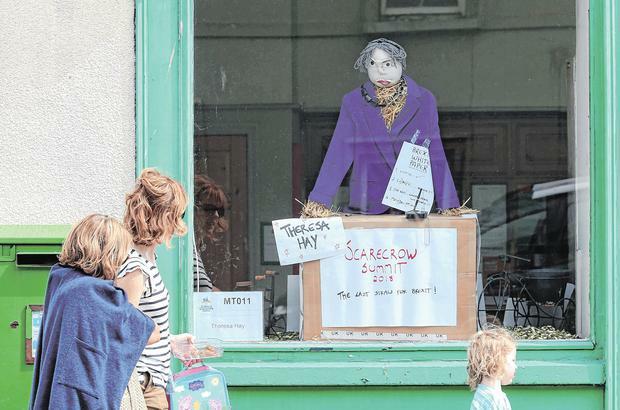 The scarecrow modelled on the UK prime minister was placed in front of a cardboard podium with a sign reading ‘Scarecrow Summit 2018 – the Last Straw for Brexit’. Now in its ninth year, the festival has a variety of competition categories, ranging from ‘most topical’ and ‘most humorous’ to youth and pre-school categories. Many entries in the All-Ireland Scarecrow Championships touched on political subjects. One scarecrow donned Melania Trump’s infamous ‘I Really Don’t Care’ jacket. Conahy Vintage Club from Co Kilkenny has taken home the top overall prize for the last three years, with visitors blown away by its gigantic King Kong creation in 2017. Emer O’Brien, organiser of the competition, says the King Kong creation shows just how quirky the entries they receive can be.